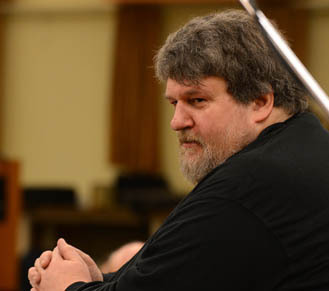 One of the pre-eminent composer-conductors in the world today, Oliver Knussen was born in Glasgow in 1952, grew up near London (where his father was principal Double Bass of the London Symphony Orchestra) and now lives in Suffolk. He is presently Artist-in-Association with the Birmingham Contemporary Music Group and Richard Rodney Bennett Professor of Music at the Royal Academy of Music. The recipient of many honours and awards, including the Nemmers Prize in 2006, the RPS Conductor Award in 2009 and The Ivors Classical Music Award in 2016, he has served as Artistic Director of the Aldeburgh Festival (1983-98), Head of Contemporary Music at the Tanglewood Music Center (1986-93), Principal Guest Conductor of the Hague Residentie Orchestra (1993-97), Music Director of the London Sinfonietta (1998-2002), and Artist-in-Association with the BBC Symphony Orchestra (2009-2014). He was appointed a CBE in 1994 and received the Queen’s Medal for Music 2015. Together with Colin Matthews he founded the Composition and Performance Courses at the Britten-Pears School in 1992 and in recent years has been invited for residencies at the Royal Academy of Music, the New England Conservatory, the Eastman School of Music, and the Library of Congress in Washington DC. Among his best-known works are the operas Where the Wild Things Are and Higglety Pigglety Pop!, written in collaboration with the late Maurice Sendak, as well as three symphonies, concertos for horn and violin, and smaller-scale works including Ophelia Dances, Coursing, Flourish with Fireworks, Songs without Voices, Two Organa and Songs for Sue. His 60th birthday was celebrated with special events in Aldeburgh, Amsterdam, Birmingham, London and Tanglewood and he has recorded more than 50 CDs for labels including Deutsche Grammophon, Decca, Virgin and NMC.